The Buttons have arrived ! These are smaller than the last ones I had printed a few years ago, but they are still glowing buttons and fun things to wear around during the holidays. 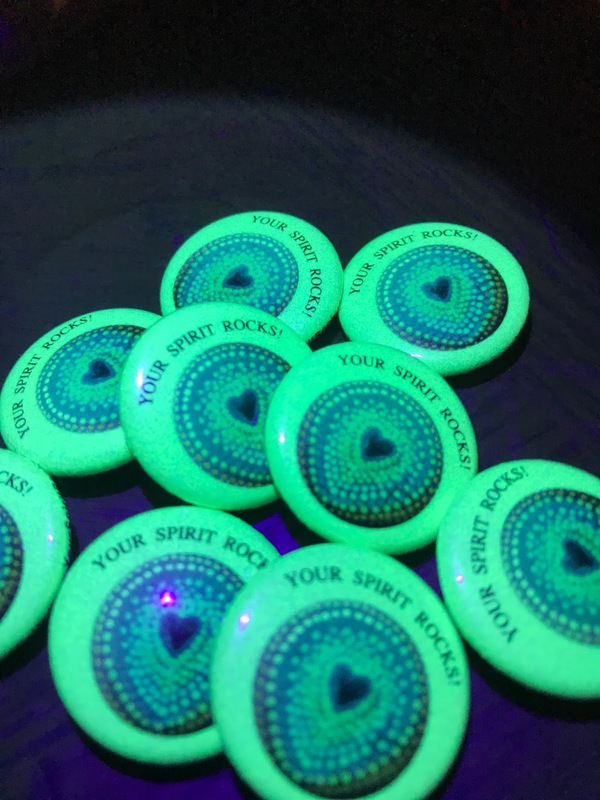 The message, "Your Spirit Rocks!" has always been a year-round greeting.Although it is intentionally a double entendre, it is also the name of my business.These buttons will be available at the Farmer's Market for a buck.Get em' while they're hot! Your Spirit Rock Buttons ! The picture here is one of my favorite rocks.It will be featured on a button that is being made to encourage this art form. The rock you see is almost perfectly round, and was found that way before it was decorated.The heart image is an iconic symbol that has come to mean many different things.Naturally,it is a symbol for love,connection,caring,sharing and friendship. Calistoga Rocks or Napa Rocks on Facebook™ is where one can VIEW these findings. *Your Spirit specifically,is the enthusiasm you bring. Not to be confused with "Bottle Rock" this rock is simply decorated with bobbles.You know, the kind that you get in the craft store or garden supply shops.First, you paint the rock, let it dry and then begin the process of gluing bobbles onto the rock.I like to use E6000™ industrial strength glue because it sets up in about 5 minutes.To prepare the bobbles, I paint on their backs or glue craft paper or a dot of glow paint on the back of each bobble. When dry, I glue them all around the rock in a seemingly uniform pattern.Voila! a bobble rock in place for your desk or nightstand. 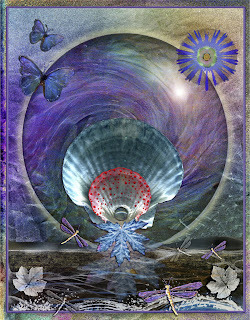 This poster was created using many scanned objects and images brought into Adobe Photoshop™ for modification, arrangement on layers, color-correction, resizing, etc. The overall composition is meant to show natural elements (scallop shells,grape leaves,dragonflies, butterflies) in a visually pleasing setting.When the poster is printed, it will be adorned with glitter, phosphorescent and fluorescent paint for ultimately a 3D effect using Chromadepth™ glasses.Click on the picture itself for a larger view.